In lighting design it is one thing to own the equipment and another to know how and where to fasten it to. Because even the best laser or moving head can?t realise its full potential when placed in the wrong spot. A possible solution to this problem is a lighting stand. One or more light lighting effects can be mounted onto it. Due to its low weight the stand is well suited for the road. It is also a good option for amateurs to consider because of its low price. It is therefore most often used during smaller events and at small clubs. If however you?re looking for a professional and more stable alternative then have a look at our truss lifts. Here it is up to you (how much stability you require) whether you want to use 2-point, 3-point or 4-point truss. All of our lifts are DGUV 17 certified and the truss is up to TÜV standards. They can bear higher weights than lighting stands and more spotlights can therefore be fastened to the truss. 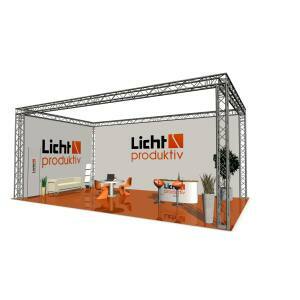 If you want to equip your exhibition stand with lighting technology then check out our exhibition stands made of truss. Moving heads and lighting devices can easily be attached to it and your stand can be illuminated perfectly. You can of course also put together your own stage. This is made easy with the help of our stage platforms.